Ahhh another Spurs season opener. Normally, my excitement is through the roof at this point. However, no Timmy, no Tony, no Kawhi…and an extended LaMarcus Aldridge. Really, I was feeling pretty meh going into this game. I am quite happy to say that I was pleasantly surprised by this game. Sure the Spurs seemed to let off the gas every ten minutes or so but it was still a solid team victory. 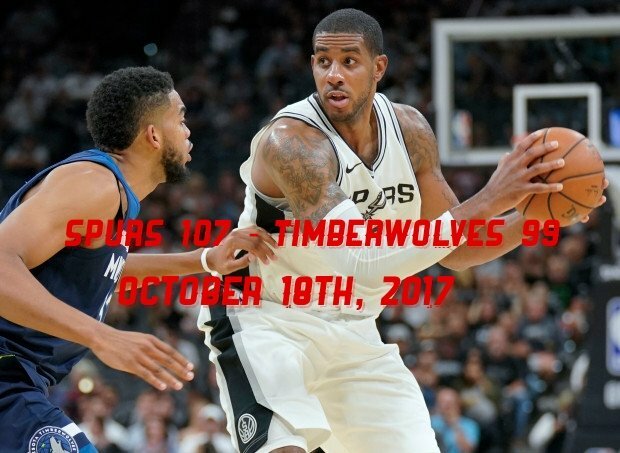 LaMarcus Aldridge – I don’t like LA on the Spurs. One of my first posts here was about how I don’t think he’s a real Spur. So it wasn’t all sunshine and lollipops for me when the Spurs extended him. (I do give him props for coming out and talking about his issues rather than dropping passive aggressive comments throughout the season while feigning happiness). He spontaneously turned Jamal Crawford into a spaz.